I don’t typically have to look far to find something that makes me smile in our community. A quick ride throughout downtown Mt. Pleasant and up and down Pickard Street in Union Township causes me to grin these days as I admire the artistic talent of community members displayed on light posts, part of Art Reach of Mid Michigan’s third annual Festival of Banners. 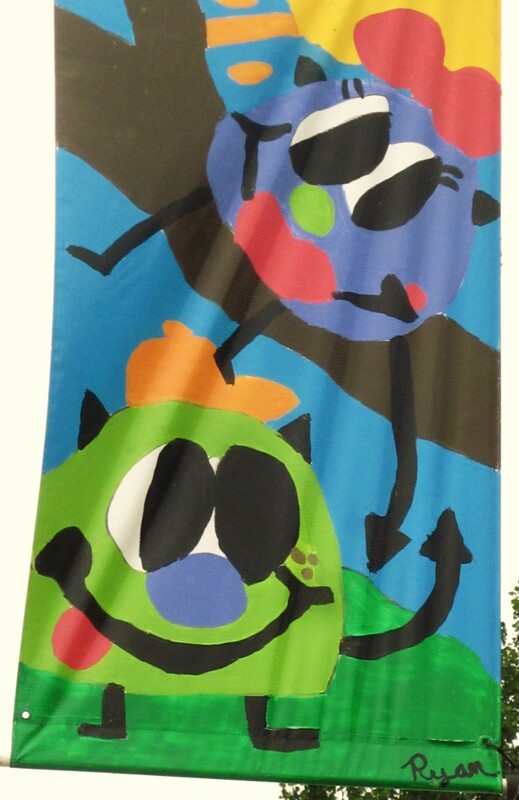 This year I experienced a close-up view of the banner project as our youngest son and resident family-artist submitted a design for the festival. I now have a stronger appreciation for local artistic talent after accompanying Ryan to “paint day”, where he spent several hours recreating the masterpiece he submitted on an 8 1/2 x 11 sheet of paper onto a 30-by-60-inch canvas, almost twice the size of him. 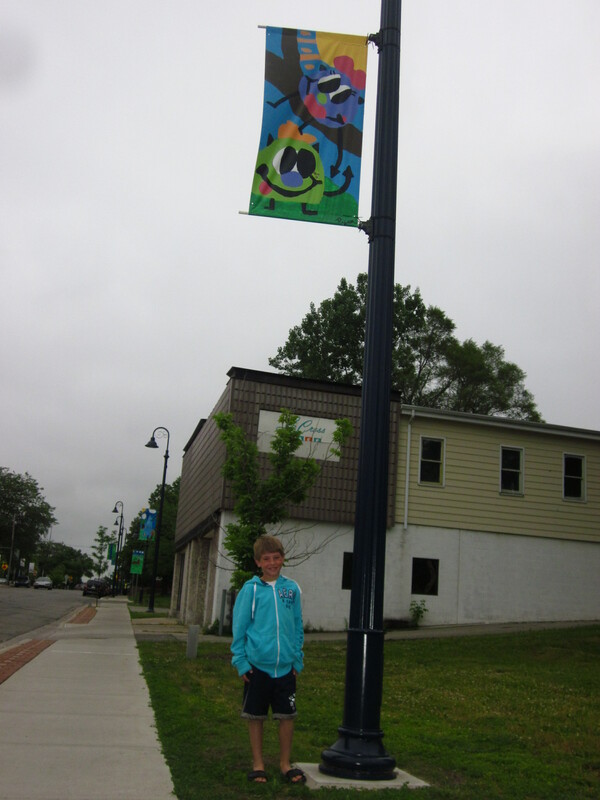 Ryan was one of 365 children, students, residents and artists to have their creativity displayed throughout Mount Pleasant and Isabella County. Watching local artists mix paint colors and bring their visions to life in vibrant color, I was in awe at the incredible amount of talent we have here in our town. An interesting and unintentional outcome of the Banner Festival this year is collaboration. Who knew such an event could generate goodwill between community entities that have not always worked from a “we’re in it together” mindset in the past. Union Township, Isabella County and the City of Mt. Pleasant have come together in the Festival of Banners. The event received rave reviews in its first two years as a City of Mt. Pleasant-only project, prompting Union Township and Isabella County to both voice an interest is expanding the project. As a result, banners are now hung throughout Union Township, Shepherd and Winn. Considering the current push at the state level, from Governor Snyder himself, to encourage and reward collaboration within communities, I’d say the effort to join forces in the Festival of Banners is a small, but perhaps significant step, in the right direction for our local governing bodies. As I see it, the door is opened … what other initiatives can we come together on to enhance and move our community forward?